Mr. Chandan was ably supported by Mrs. Asha Vijaykumar Mutalik and Mrs. Alka Jain from BAAR BAAR RAFI Fan Club of Bangalore as well as Mrs. Lalitha Sivaprasad and Mr. S. Narayan. Another regular Rafi Fan club member, Mrs. Alka came out with the melodious Jaane Kyun Log Mohabbat from MEHBOOB KI MEHENDI, but she bowled over every one with Ye Hai Reshami from MERE SANAM including the characteristic Asha Bhonsle giggling in the song. This entry was posted on Sunday, March 22nd, 2009 at 10:45 am	and is filed under Events. You can follow any responses to this entry through the RSS 2.0 feed. You can leave a response, or trackback from your own site. I think this Kairali program is not the one, which was referred to. Of course I am fairly regular for this Kairali program aired on every sunday from 9 to 9.30 AM, where Rafi admirers speek about Rafi (I wish I had known Malayalam). Also few movie songs of Rafi (video) are played apart from some Rafi singers singing Rafi songs. The program is failry interesting. Old and even young boys, fans of Rafi are interviewed. I haven’t heard about the youngster so far. Let me check with my friends in Kerala. hello friends, particularly those from kerala. on doordarshan kerala i understand there is a weekly programme titled ‘dil ki awaz suno’ where a youngster – asad is the name i learnt – sings rafi sahab’s songs to near perfection. some of my friends have been telling me of this for sometime now. unfortunately we do not get this channel at my place and i have never watched or listened to the programme. one of our members (d subramaniam) had telephoned to me tonight at 10.30 p.m. when the programme was being aired and made me listen to two of the songs over telephone and i can say that this singer – asad – is making waves. those of our friends who have seen this programme themselves may shed some more light on this newfound singer. i tried to locate information and audio/video of this programme on the internet, but it is not available. i also checked up doordarshan, thiruvanthapuram programme schedules which are not uptodate. any one who can give more info ?? i understand the programme is telecast on every saturday and sunday though at different timings. looking forward to more info from our friends. Such events should be organized to pay tributes to Great Rafi Sb. Many thanks to Gurumurtyji for bringing those sweet memories of the evening where Chandanji mesemerised and captivated the audience with classics of Rafi sahab. Hearty congrats to you sir…. Also congrats to the BaarBaar Rafi members Asha, Alka and Lalitha for an excellent rendering and support to our star Chandan saab.. Thanks for your suggestion. In fact, I have already thought about it and to tell you very honestly, my thoughts are always with the Bangalore BBR group and every team member. The interactions which I had with the members of BBR members during my rehearsals each of the four weeks ending in Feb 2009 have drawn me very close to each and every one of you that I will certainly make frequent trips to Bangalore from now on. It will only be my pleasure to meet and spend good quality time discussing and singing Rafi numbers and also get to hear the talented singers of Bangalore especially BBR team members. all rafi saaheb lovers and singers : mohd rafi can never die; only death can die . through his – immortal songs. long live the king, his melody and all his fans. Your participation in the Rafi e-group has enriched the quality of discussions on Rafi Saab. In fact I have a suggestion. We, Rafi Fans of Bangalore usually have a get-together once in two or three months. We request you to make it convenient to attend one of the get-togethers so that the other rafi Fans of Bangalore get the oppertunity to interact with you as well listen to your songs. I assure you that there are many die-hard Rafi Fans in the group and you would feel elated meeting them. Heartiest congrats on the performance at Bangalore ably organised by your nephews and nieces. The sample of your talent was given at the wedding reception of your niece (Narasimhan’s daughter), but performances at marriage receptions tend to be jarring, amidst the din of noise from the audience. Glad an exclusive programme was arranged at Bangalore and all the testimonials bear out the fact that you are a great performer of Rafi’s songs. Pl. inform me when you have your next programme in Chennai. Thanks for the tip. I will certainly do it. Many thanks. In fact, as I had mentioned somewhere earlier, I am sort of drawn towards the BBR team members and cannot wait to come over to Bangalore more frequently to spend a good time with all of you to share and also know more about Rafi Sahab. I always felt that the “goodness” of a human being comes through perfect expressions with emotions and that is what is all about Rafi Sahab. Each of his song I listen to a million times, there is a “goldmine” of more learning and perfection that one needs to accomplish. I can only say ” What a great singer” !!!! To have one more competent rafi singer in our midst – is indeed good news. I have heard about mr.chandar many a times and it will be also fortunate that he will be visiting mumbai on may 5th and singing at bandra bandstand open air auditorim on the naushad chowk road, diagnally opposite to the maestros residence often termed as the temple of music. mr.chandan along with many other singers will be paying tributes to the memory of naushaad saaheb on his third jayanti. its good news and best wishes. Hearty congratulations to Chandanji our very good friend and more than that a very good singer who sings with utmost sincerity. 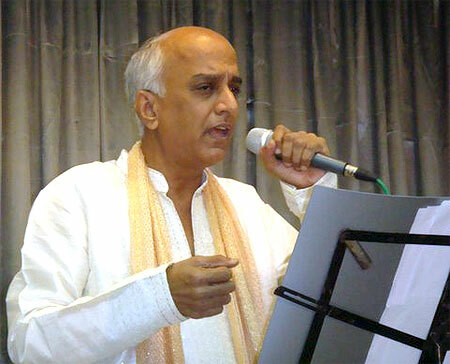 having heard him myself, though not live on a programme, i know how well an accomplished singer that chandanji is. yes chandanji can record his songs on websites too like midomi.com to reach larger music lovers. 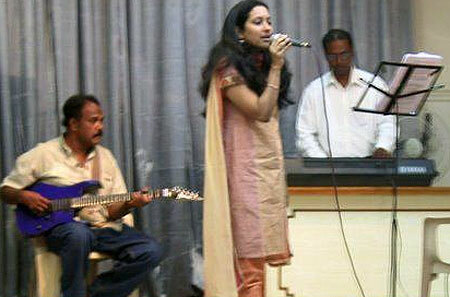 i also request him to send to me all his recordings in mp3 format which will be uploaded on my blog page : http://rafimurty.multiply.com where we do have a separate folder for such talented and good singers. chandanji not only sings with the sincerity that i was mentioning, but is also very modest and humble by nature and would encourage other singers, a trait that is sadly not available with many of the professional singers. gurumurthyji thanks to you too for the splendid write up, laced with the lovely photographs and for the link to the full set of photos. the choice of songs by chandanji was again a composition of all moods of rafi sahab. 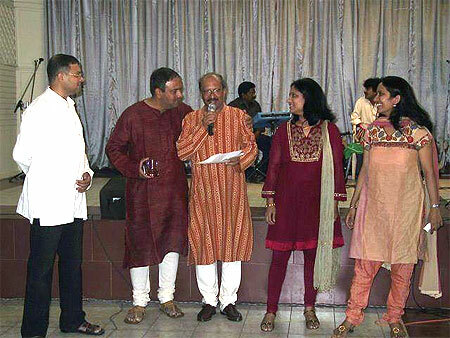 the songs presented by other singers are also very melodious and congratulations to each one of them. i wish i was there and keep it up chandanji and all other music lovers from bangalore. We have all experienced Chandan’s show live and his superb singing prowess.. and this article is a lovely finishing touch to, what was, a thoroughly enjoyable show of our favorite Rafi songs. 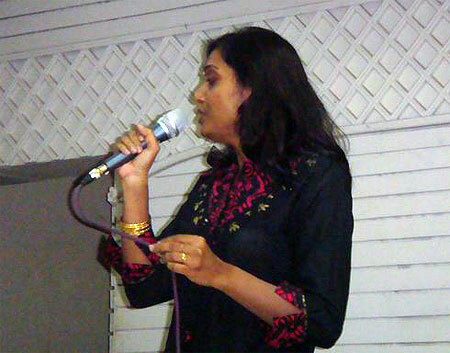 Asha, Alkha, Lalitha, Anu and Babu thanks for entertaining a very eager audience with your individual talents. Guruji you have put together a fine picture of the entire show with your writing skills. Its been a pleasure to read your synopsis. Congratulations to each one of you.. I also fan of Rafi Sahab, the sangeet required voice of Rafi and he fully justified with the songs sang by him. Still many too much lover listning songs of Rafi sahab. MAY GOD GIVE HIM MORE SUCESS IN ALL LIFE. great performance. i wish i was there i could feel the music . sir keep it up u r wonderful . u bring back all the good days back today. wish u more glory. love and regards u r small fan at chennai. benefit of those who haven’t heard you sir. I know how i felt after listening to your ‘man tarpat’ and i genuinely wish rest of the rafi fans too get that opportunity. There is a site called ‘midomi’ which is an audio equivalent of youtube, wherein you can record your songs and simply share the links. Gurubhai, i appreciate your initiative and thanks for letting the world know the aroma of chandan bhai’s gifted voice. pure sandalwood. Many thanks for your write up and publishing your article. My heart was full of happiness and it was personally extremely satisfying in performing before an excellent, reactive and very responsive audience at Bangalore, especially BBR members. Congratulations from your nephew on a fantastic job. The folks in Bangalore can’t stop talking about this day! Raji, Lalitha, and others, congratulations in putting together this great show. greetings of the day. great article, great event & great songs of Rafi Saheb. The songs selected for the event are all time hits. thanks a lot for sharing the event and reading this article, really “Dil Mera Kho Gaya” but before Sham in afternoon.